Fiberglass Tubs and Terrace Sets provide the great opportunity to accentuate the uniqueness of the facility’s design. They will not only perfectly fit into the room or terrace but also allow you to save much space. 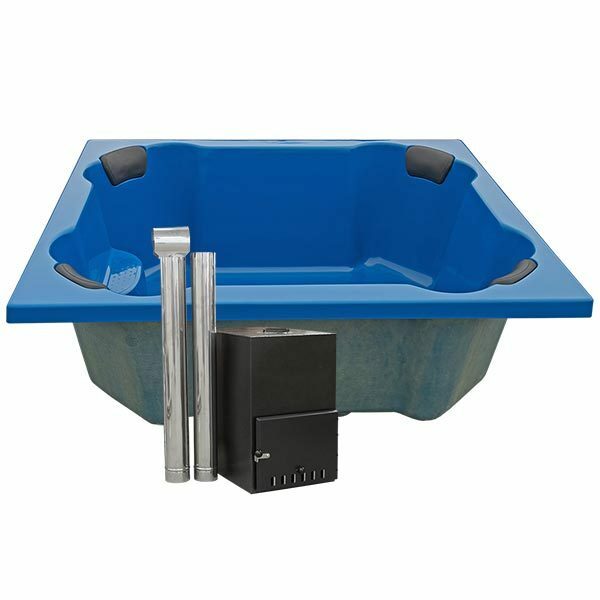 These tubs and terrace sets have very reasonable prices. We provide you with the tub or set, while you decide where it fits best in your house and create your own inimitable design. The area around the bath can be decorated in various ways, according to your needs, tastes and wishes. Thus, it can be edged with decorative stone, tiled with tiles of any colour and texture, or even panelled with wood. All the baths are spacious enough to accommodate the whole family or a company of 5-8 people. Such a fiberglass tub can become a real godsend for spa facilities! They can be installed either in the pool areas or in separate rooms for treatments. A tub can be filled with hot or cold water for different purposes and procedures. Its cleaning will not demand much time or effort. It can be easily cleaned with liquid washing agents used for cleaning of swimming pools. The tub can also be equipped with a bubble- or hydro massage system, as well as Led-light system. This improved option will definitely bring lots of joy and fun to families with children. Another option is to install a terrace set in a backyard of your house and enjoy bathing in the fresh air. As the set is equipped with a wood-burning stove, the water can be easily heated to the comfortable temperature. You can refresh yourself in cool water during the hot summer day, or relax in pleasantly hot water under the starry sky in the middle of a snow-covered garden during the frosty winter evening. In other words, there is always something interesting to do with your fiberglass tub! Instead of wasting regular evening on simply watching TV, spend some quality time together with your family. Relaxing atmosphere will surely promote heart-to-heart chat and positive emotions, strengthening family bonds. By the way, why not to start a family tradition of getting together in a hot tub and sharing the most recent news from your lives, for example, once a week? What is more, this small ritual can become a part of a family barbecue party. In case your life lacks romance, have a romantic date in the middle of your own garden, or at the terrace! Decorate the surrounding area with candles; switch on romantic music, uncork some champagne, add into water several drops of aroma oils and enjoy fantastic evening with your beloved! For those who are tired of a constant rush and busy lifestyle, who would like to escape from daily routine, there is another option. Fill the tub with hot water, get into it with your favourite book, turn on relaxing music and try to meditate, or simply lean back with your eyes closed and enjoy the silence and sounds of nature.